An adolescent comes in with fever, abdo pain, vomiting, lethargy and malaise. 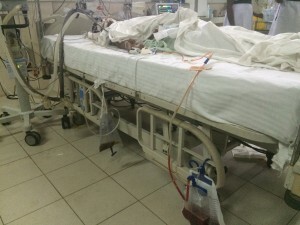 He had been sick for about 7 days and had been at the local hospital 80 km away for 24 hrs. On presentation he had a BP of 58/25 and a pulse of 65. He had a tender abdomen which was mildly distended a few cervical and inguinal lymph nodes and bibasal crackles. He was given NS resuscitation and was intubated and ventilated. Before long he was on Norad and dopamine. On day 3 when I met him, his aPTT was >300. Platelets were 5. His LFTs became grossly abnormal and his abdomen distended markedly. After FFP and platelets, I inserted a Peritoneal dialysis catheter under USS as a temporary drain and put in a femoral CVC. Thats the peritoneal drain on the right, NG on the left. He had anuria for 24 hrs, and it as thought he was too unstable for CRRT as he had a BP of 84 on 3 inotropes. That night he developed sine wave from hyperkalaemia and when I saw him again he was on calcium, HCO3 and insulin dextrose infusions. There was no choice but to try and dialyse him so I put in a vascath, but unfortunately as we were connecting up after , his BP which had been falling all day on maximum inotropes in association with the persistent K+ induced abnormal rhythm finally bottomed out and he died. Statistically he never really stood a chance from arrival, despite the amazing efforts of the ETU and medical teams. Summary of his major abnormalities was fever and lethargy with developing abdo pain then raised HCT which fell after NS , thrombocytopenia, renal and then hepatic failure and DIC, gross ascites with abdo compartment syndrome (pleural effusions as well). This highlights the fortunately rare absolute worst case of a common condition. Which one is it? Hi Mangala -absolutely correct -an easy one for Sri Lankans but tough for us Aussies! Usual dengue fever is a self limiting 5-10 day illness characterised by high fever, myalgia, retroorbital headache, vomiting and anorexia. Some people get an erythematous rash, sore throat, lymphadenopathy or diarrhoea – i.e. indistinguishable from other viral infections. Severe dengue including dengue hemorrhagic fever occurs in less than 1% and is more common/severe at extremes of age. Patients enter the critical dengue phase after day 5, usually associated with defeverscence and this phase is diagnosed by signs of plasma leakage. Here at THK we assess for this with a HCT (done as a PCV in the ED) which if it rises 20% from baseline is considered diagnostic; and USS looking for pericholecystic fluid. Bedside tests also include a tourniquet test looking for petechiae which come with thrombocytopaenia. WCC is usually <5 at this stage . IgG and IgM are positive after day 5, but not usually done. Treatment of critical phase without bleeding is a careful restoration of Intravasc volume using PCV change as a marker to avoid under or excessive fluid replacement. Pleural effusion and ascites are common . A sudden drop in PCV usually indicates bleeding which is a more serious manifestation. Rarely, as in this case, dengue shock syndrome and then MODS develops. Most common and serious manifestations include myocardial dysfunction, renal failure and hepatic encephalopathy - which unfortunately our patient had all 3 of. The key to avoiding MODS is early recognition and aggressive treatment of shock - often the sickest patients have come from small regional areas and arrived in established shock. well looking at the intial presentation with WBC of 22 000+ i might think of Lepto as first DD..any thoughts NICk?